Nonjatta - shōchū: Lesson 3: What is kōji? 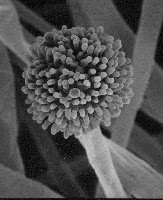 A microscopic photo of a kōji spore. Kōjikin (麹菌) are a type of mould spore that are cultivated onto an ingredient like rice or barley to make a kōji (麹) mould. This in turn turns starches in the ingredient into sugars. These sugars can be fermented. And we all know what that means! Alcohol! Of course many of you will have knocked back gallons of beer or wine in your time without having the first clue about how they are made. So why is Kōji the third lesson in my introductory course? Because there are different types of kōji and they make a difference to the taste of shōchū. White (白麹菌 - shirokōjikin): Easy for the distillers to use and is therefore the most widely used shōchū kōjikin today. It was invented as recently as 1923 as a more easily used refinement of black kōjikin. If you see that character near the characters for kōji above, you have an evens chance of it being black koujikin. On the other hand, it might just be made near black mountain or by a black bottomed monk or something. Many bottles of shōchū do not state clearly what kind of kōjikin they are using. However, they all state what ingredient the spores have been cultured on to to make the kōji. There are two ingredients in common use, rice and "mugi", and the choice between the two effects the flavour. It is sometimes but not always the case that the main ingredient of the shōchū is the same ingredient used to make the kōji. You will find the characters for rice and "mugi" in the list of ingredients in lesson two (or in the vocab crib sheet). Look for them in conjunction with the kōji characters.